The Spring Fashionista Giveaway Event is hosted by The Chief Blonde at Still Blonde After All These Years http://stillblondeafteralltheseyears.com and Katy from ModlyChic http://www.modlychic.com/. All Fashion! Only FASHION event! 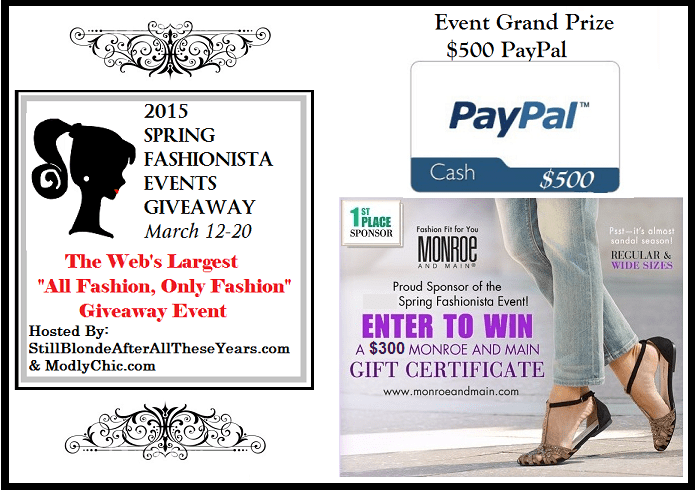 Largest Fashion Giveaway event on the internet with $26,000+ in prizes, 100+ participating blogs and 3/4 million entries. Each individual blog has a minimum of $125 prize! Monroe and Main is one of my favorite places to purchase unique and well-made clothing items. They always have a fabulous selection of dresses, and I will be competing for the main prize with the rest of you! I am excited with the bags that I have found for this giveaway, and I will be adding a beautiful 11×15 canvas print from Fabness. I have ordered mine and cannot wait for my favorite pictures to be transferred to canvas, and I know that you will want to share your awesome new look with everyone and maybe even memorialize it with this canvas print! While Fabness and I have teamed up and they are providing the canvas print at no charge to myself, I decided to create a hodgepodge of fun things for this years Fashionista Even! As I mentioned before, I love looking at bags, and scarves, and I had a great time reviewing my favorite online clothing and accessory stores. I considered gift cards from Monroe and Company, 9th & Main, Sweet Salt Clothing, Lorna Jane and so many others. Ultimately my favorite is and remains Sorella Bella. I featured them in the fall and still love the beautiful dresses and skirts. I will be revamping my spring wardrobe using them and the others as soon as I can afford to shop. With great online retailers and cash back programs you can create a whole new wardrobe every season for a reasonable price. Since a canvas print is fun, but not necessarily a fashion item, and I just got to see the new Disney Cinderella Premier! I am in love with everything Cinderella and wanted to create a theme around it for my giveaway so I give you my Spring Fashionista “Cinderella” Giveaway! Since Cinderella started first as a Lady in a household who had loads of work to do. I have a beautiful and functional pink “Everything Bag” that has pockets for, well, everything! I got myself one in green just because I love it so, but if you really prefer I may be willing to part with the green, it just depends on your nice comments below! There is also an adorable pink Fossil Wallet to go with it, and a pretty blue and white scarf for tying back your hair. For evening I have a nice handbag (who is currently playing picture shy). 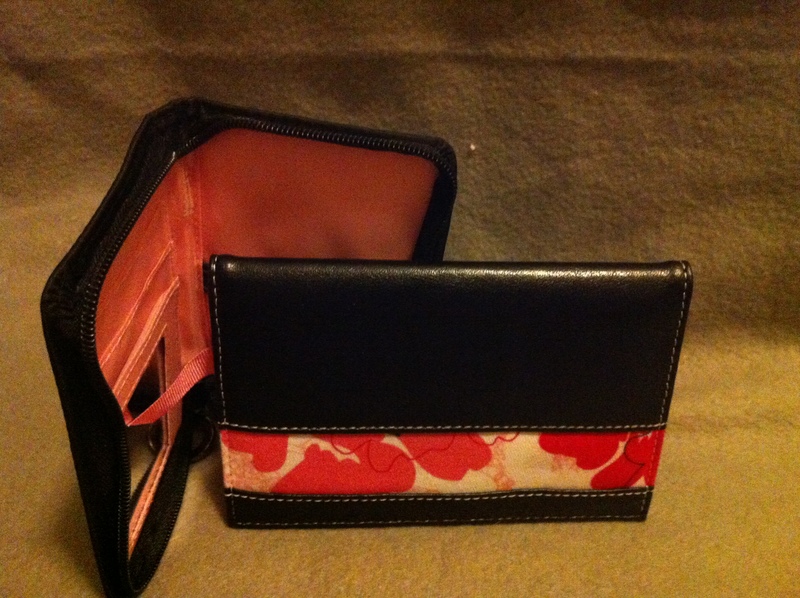 It has a Mary Kay Passport cover, and eye-make-up wallet to go with it for a great evening out. I tried to find the perfect shoes, but can’t make them fit you perfectly, so you’ll have to do that on your own. I hope you love and enjoy these bags as much as I enjoyed shopping for them. Please enter the rafflecopter below. LEGAL Stuff: 18 years of age or older to enter. US Only! Read Instructions carefully because rules vary from contest to contest. Make sure to provide a correct email address so we can reach you if you win. You have 48 hours to respond once contacted. Still Blonde after all these YEARS , Modly Chic, SPRING Fashionista Events Giveaway or the Spring Fashionista Events Giveaway bloggers are not responsible for sponsors/bloggers that do not fulfill their prizes or for any product failure or harm caused thereby. In most cases, shipping of prizes is the responsibility of the sponsors who will be sending prizes to you directly. Your prize should arrive within 30 days, let us know if it doesn’t and we will TRY TO HELP OUT! The writer of this giveaway received a sample for this review. Compensation was not provided. Opinions expressed are News Wahl’s own. This Giveaway is not affiliated with, associated with or promoted by Facebook. Happy Entering! I really like the wallet! I LOVE the wallet the most thanks for the chance to win it!! I seem to go through wallets like crazy, so I’d love to win this one! I love shopping for handbags and I am always looking for something with a wow factor. I definitely need a bag with a pocket for everything, love it!! I love the bright pink color of that purse! I like the Everything Bag. I love pink, and I have a strange obsession with bags. I have way too many. The bag and wallet are great! I love the pink. Perfect for spring! I’m a gal all abou matching so that’s what I like best! I love the colors of the wallet. This is a great giveaway package. Also — this hop is HUGE there are so many great prizes. I love the chance to win a Fossil wallet and Everything bag. I love the coral colored “everything” bag you are sharing! Thanks for the giveaway! I love the handbag! I am in serious need of a new handbag as the one I currently use I’ve had for the last three years. It’s falling apart and I could use the change, so I would love a new handbag. I love that these are items that I love and can use. I like the pink one with lots of pockets. I love the beautiful Spring color of the bag! I really love the light tone, it would match everything I have! I love the Wallet, it is very Pretty! Your picture shy handbag sounds great – I love being able to swap out bags for every occasion. I love that they’re my favorite color and they’re matching! I also love that the bag has lots of pockets and organization because I’m terrible for having a messy bag. i love the fossil wallet,,super cute!! I really like the everything bag. I like having a bag I can throw everything into, and it’s cute. i love how pretty the wallett is. i like the print on it. I love the everything bag, I love bags and purses, but I have a hard time buying them. This bag is awesome and I love the color. The color of the bag is simply amazing! It is much needed pop of color after a long winter. Love the color of the bag. Very spring like. Thanks! I love the handbag. I need a new one. I like that you came up with a theme, it’s cute! What I like about this giveaway are the Mary Kay Passport cover, and eye-make-up wallet. These are items that I have not seen before and that I do not have. I like the wallet. So very stylish. I love all of these giveaways. I love the pink bag and the wallet. This giveaway has been so fun. I love the everything bag, it really suits my style. I like the colors. I always buy black….boring! I love this giveaway. I love the colors!! I like everything and purses are so much fun. Love the Spring color of the bag! I really like the Everything bag, I’m the kind of person who needs a spot for everything! I love that its for items I can use everyday! I like that there is both a daytime and an evening option! I love the Fossil wallet. It’s really nice to have extra bags to use for special occasions! I love all the pink in this giveaway! It’s my favorite color. It’s always fun to have a new bag. I love the Fossil wallet and the Mary Kay Passport cover. I love how cute that wallet is, pretty print on it. I really like the pink everything bag, I currently have only a diaper bag, but the kids are getting a little older and I’ve noticed I don’t need so much stuff with me anymore. It would be great to downsize. I love the Fossil wallet! Thank you so much for offering such a wonderful giveaway. my daughter would love the Fossil wallet, while I love the bag in pink! I really love the bag and wallet. Plus, mine is falling apart. I love this as i love new fashion items and seeing all the beautiful items in this event. I really like the wallet. I think the bag is super cute! I love the bag. I’m all about bags with lots of pockets. It makes me feel like I’m at least attempting to keep the purse organized! I love the bag and I love that you gave the giveaway a Cinderella theme. I love the Fashionista hop and you made it a little more fun. My girlfriend likes the Fossil Wallet! I love that wallet. It is very pretty and bright. I’m most excited about the wallet and the blue and white scarf to tie my hair. Love this! I love the bag the most. I love that it’s not only fashionable but functional! Great items. I like the evening bag which will be perfect when I do not want to take everything with for an evening out. I love that there are so many giveaways in one area. I love this giveaway for it’s Cinderella theme! I love Cinderella, Too! Also, I am excited about the canvas print from Fabness!